On September 7, 1776, American revolutionary Ezra Lee attempted to use his invention, a submarine he called the Turtle, in combat. The hand powered little one man sub did not perform as expected, and Lee was unable to attach his offensive explosive charge to a British warship. Twice in the past we have used this example and the B-32 Dominator to make a list of 10 Underperforming Weapons and 5 More Underperforming Weapons. Today we take this opportunity to list another 5 weapons that disappointed the people meant to use them. What weapons or weapon systems would you add to the list? 1. M-4 Sherman Tank, 1942. When the American Army introduced the M-4 Sherman tank in 1942, many officers felt they had a world beater in their hands. They were mistaken! In 1942 the Sherman was indeed a good match for German Pz-3 and Pz-4 tanks, but by the time the Sherman saw combat in 1943, it was already outclassed. Problems with the Sherman were too weak a gun (as the 75mm short barreled gun was just too low velocity to prove effective at penetrating enemy armor), too thin armor (easily penetrated at great distances by German long barreled 75mm and 88mm guns), and a propensity to catch on fire, earning them the nickname, “Ronson” (after the cigarette lighter, “lights first time, every time!”) Despite the shortcomings, planners figured it was too late to change designs, and Shermans were just mass produced (over 49,000 of them, about as many as all types of German tanks combined! ), expected to overwhelm the Germans by mere numbers, which they did, at the cost of thousands of Allied lives. As far as the war in the Pacific, the Japanese did not field a better tank so the Sherman was more than good enough for that theater. On the plus side, the Sherman was easy to produce, was reliable, and was turned into a myriad of specialty vehicles. Some are still serving with 3rd World countries. In the late 19th Century, the armies of the World were turning to bolt action rifles (that could easily be fired from many positions, including prone) with ammunition powered by the new, powerful, smokeless powder. The US solution was to adopt the M-1892, and then modified M-1899 Krag-Jorgensen rifle in .30-40 Krag caliber. The ammunition was weaker than the competition, with a round nosed bullet that did not fare well at long ranges. A muzzle velocity of 2000 feet per second launching the 220 grain round nosed bullet was effective against people at close or moderate range, but failed as a long-distance cartridge. 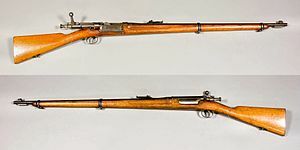 The rifle itself operated reliably and as smoothly as any competitor, but had to be loaded from the side with loose ammo, compared to the competition (K-98 Mauser, Lee-Enfield, M-1891 Mosin-Nagant) which were loaded much more quickly by means of “stripper clips.” The deficiencies of the Krag were highlighted in painful detail during the Spanish-American War, and the US Army replaced the Krag with the wonderful M-1903 Springfield rifle in .30-06 caliber, a more powerful round with a Spitzer (pointed bullet in 1903, leaving the Krag a run of only 11 years as the main battle rifle of the US. 3. .38 Special Caliber Police Revolver, 1898. Designed in response to the inadequate performance of the .38 Long Colt Caliber revolvers issued to the US Army, and an improvement over the pathetic .38 Smith & Wesson Caliber revolvers commonly in use, the .38 Special was supposed to be the hot rod pistol cartridge that would make larger calibers (.44 and .45) obsolete. In this regard, the caliber failed miserably. Launching a round nosed lead (or round nosed full metal jacket) 158 grain bullet at (best) 800 feet per second, with initial ammunition using Black Powder. Moving up to a 200 grain bullet made for even slower velocities, in the 600-700 feet per second range. Compounding the problem with weak performance was the use of short barreled revolvers of 4 or few inches in length. Snub nosed pistols were especially pathetic. Police found themselves often outgunned by bad guys carrying .45 ACP semi-automatic pistols or .38 Super semi-autos. The .38 Special bullet was also much to blame, as the normal 158 lead round nosed round did not penetrate barriers very well and was going too slow to deform on flesh. Full metal jacket rounds as used by the military fared even worse on flesh, passing through bodies with minimal disruption of the body. Smokeless powder got muzzle velocity up to around a respectable 900 feet per second, but poor bullet design kept the cartridge from being particularly effective. Even after superior ammunition made its debut in large supplies in the 1970’s (including higher pressure “+P” rounds), many Police agencies refused to allow officers to carry hollow point ammunition for political and public relations reasons, relegating their police officers to a position of inferiority in gun battles. Another huge drawback of the .38 Special revolver is its low ammunition capacity, normally either 5 or 6 rounds, and its laborious reloading procedure compared to lightning fast reloads with magazine fed semi-auto pistols. The .357 Magnum revolver was invented specifically to correct the deficiencies in .38 Special ammo in 1934, but again, use of simple round nosed bullets limited effectiveness and most police stayed with the .38 Special. Starting in the 1970’s and rapidly accelerating in the 1980’s, an enormous switch in police armament took place, with nearly all police agencies today opting for semi-automatic pistols in 9mm Luger, .40 S&W, or .45 ACP calibers. Even as a back- up gun, the .38 Special revolver is eclipsed by easy to conceal semi autos. On top of easier reloads and more effective calibers, the semi autos commonly have enormous capacity magazines, from 12 to 20 rounds. The .38 Special belongs in the nightstand next to the bed. 4. M-28, M-29 Davy Crockett Nuclear Weapon Launcher. A sort of recoil-less rifle/rocket launcher type of weapon that threw a 10 to 20 kiloton (about like the Hiroshima and Nagasaki nuclear bombs) only a pathetic 1.25 to 2.5 miles, the guys launching it had to be crazy or suicidal to be that close to a nuke they were setting off! An alternate warhead had a variable yield of ¼ to 1 kiloton. Manufacture of this waste of money started in 1956, and use of this dangerous toy ended in Europe (its intended theater of operation) in 1967, and was totally retired in 1971. The idea was that a small team in a Jeep or armored personnel carrier could quickly set up and fire this weapon to stop mass tank assaults expected from a Soviet attack into West Germany. Radiation was expected to kill many of those casualties caused by the warhead. Estimates of the US arsenal of nuclear warheads approach 70,000 weapons, with the vast majority in storage. The smaller numbers you usually see cited in literature are those warheads in ready use. 5. Yokosuka MXY-7 Ohka (“Baka Bomb”), 1945. By 1945 defeat for Japan was evident to anyone with eyes and ears. Desperate measures were needed if Japan was going to have any hope whatsoever of a negotiated peace, and suicide (“Kamikaze”) airplanes were one of the answers. Instead of dropping a bomb on a US ship, a pilot would fly his bomb laden fighter or bomber directly into the vessel, guaranteeing accuracy at the expense of the pilot’s life. Such laden airplanes were easy pickings for US fighter planes, so another plan was needed. Enter the rocket powered MXY-7 Ohka (Cherry Blossom), a suicide plane containing a one ton explosive load in the nose and capable of 650 miles per hour in a rocket assisted dive. At such speeds, the Ohka could not be intercepted and presented a difficult, almost impossible target for anti-aircraft gunners. Over 850 of these suicide rocket planes were made, carried into battle by twin engine Japanese bombers until close enough (about 20 miles) to US ships to detach from the bomber and make their high speed run. Japanese planners apparently ignored or forgot about the fact that 20 miles is way too short a distance to avoid US fighters, and the heavily laden bombers carrying the Ohkas were easily shot down. Only a few hits were recorded, and some damage was caused by near misses, but certainly not worth the lost bombers and pilots of the Ohkas. The plan was an abject failure, though it did strike fear into US sailors. Conventional aircraft had a bit more success as suicide “Kamikaze” aircraft, though not enough to deter US advances.